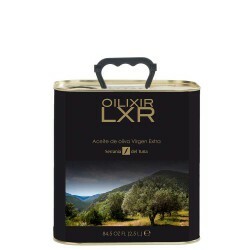 Olive Oil Can Bottle 2.5 L. Venta del Baron Coupage. Hojiblanca and Picudo D.O.P. Priego de Córdoba. Venta del Baron is an extra virgin that won over 60 awards, it has given by more than 8 different countries, and holds the position, several times, as Best World Oil. Behind this excellent oil is Mueloliva y Minerva, S.L, oil producers with a long tradition, located in Priego de Córdoba (Córdoba) whose designation of origin is the hallmark of the best qualities of the market. It has extraordinary culinary and nutritional conditions which makes it unique among most gourmet kitchens. Much it is so, that this oil is widely used by chefs of great prestige, even outstanding restaurants with Michelin stars. A slice of rustic bread and a little bit of this oil ... mmmmmm !!! !